I had cherries and chocolate on the brain for a couple of weeks now. At some point fennel entered the picture, but I don't recall when or why. I work across the street from the San Francisco Ferry Building which is fantastic place for seeking gastronomic inspiration. 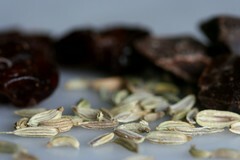 I purchased some dried, unsulphered, unsweetened cherries from Capay Organic, everything else I had in stock. I got ever so slightly experimental by soaking half the cherries in brandy overnight and left the other half alone. I took this recipe recently posted on Flickr by MarionQuaggatuggu. I divided the batter in half and folded in drained and chopped brandy-soaked cherries for an adult version and folded in chopped plain cherries and Valrhona chunks for a kid-friendly version. The result was more than I could hope for - rich, moist, dense, but flakey cake with a deep chocolate flavor and the occasional texture variation and kick from the brandy-soaked cherries. I preferred the brandy version personally. I got this basic pastillage recipe from the internet. I was looking for something that didn't have any special ingredients like gumtex or glucose. I wasn't up for a ride to the cake supply store. I found this pastillage difficult to work with. I couldn't get it very thin (I think partly because it was slightly sticky) and a lot of my shapes cracked when I went to remove them. The recipe makes plenty though, so I had enough shapes that worked out alright and still have two balls left over. This is one of the best blogs I've seen in a long time. Can I link you up to my blog? Cupcake, you always surprise me. You have inspired me to be more adventurous. I have started to crawl now in the cupcake world. I made these last night with several mods. I didn't have dried cherries so I used Trader Joe's cherry preserves--scooping out the whole cherries and leaving behind the jelly. I used 82% scharfenberger cacao. And, I made a homemade chocolate ganache frosting. I topped these with a maraschino cherry--I know, BAD! But, they were going to my husband's work this morning. They sure looked cute and the taster cupcake was amazing. Thanks for the recipe. 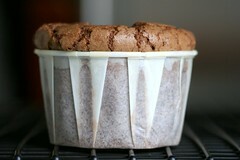 What kind of cupcake pants / tins do you use? i have always been inspired by your cupcake arts. You gave me a motive to learn & buy cupcake books. can't wait to join the cupcake world. Do you own a bakery? 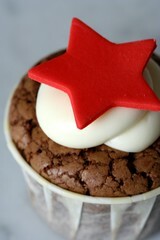 I adore your cupcakes as they are always visually and culinarily fabulous! Thanks for another wonderful recipe! fat girl, of course you can link to my blog! valentina, i am oh so glad that my recipes are inspiring you. i made the potatos this weekend, they were delicious. served them with grilled flank steak and garlic and parsley aoili. yum. hi, latifa. i am happy that you are inspired by cupcakes. they are wonderful things. i don't own a bakery, i do this purely for fun. ok, sometimes i trade cupcakes for money, but rarely. Hi Chockylit! As another cupcake baker and San Francisco resident, I find your blog charming and so inspiring! I was planning to ask you where your cake supply store it, as I cannot find any around here and am stuck buying my cupcake supplies at Michael's (which actually does carry your nut & party cups, although I haven't tried baking in them yet) - but, perfect timing with your questions, now I know to go to Sugar N Spice. I am looking forward to it and thanks for all of the great ideas! I've been thinking of doing a chocolate and strawberry combo, so I think I will borrow your latest recipe and change the fruit. Yum! What a wonderful blog! I´m delighted to the point where my toes curl! Alanna, of course you are welcome to link to this recipe! Perhaps the first dessert of the bunch? hi chockylit! i just sent you an email yesterday on flickr and wasn't sure if you had received it, since it's my first time using that site. so, i am posting my comments and questions here, just in case. i just discovered your blog and love it! i too am an avid dessert and cupcake baker, and also use somewhat unusual ingredients to make some of my own cupcakes. i use to do it professionally, then took some time off (it was very stressful). but now, i have friends and clients wanting me to bake for them. it's hard to refuse friends, especially. anyway, i stumbled on some photos of your kitchen remodel and thought i would ask you your advice and opinion, from one baker to another. i'm getting ready to start my own kitchen remodel and wanted a good quality kitchen suited for a baker. can you send me your opinions, comments, suggestions, and references on good countertops (marble or granite? ), kitchen cabinetmakers, etc.? i'm in oakland, by the way. so your opinion would be greatly appreciated. by the way, i love your kitchen remodel. fantastic colors! for your help, i would love to bring you some of my experimental cupcakes that i am going to test out soon - vanilla cupcakes with kaffir lime mousse and tamarind-scented frosting (my homage to Thai food and desserts). My boyfriend and I made and served these today--they were a HUGE hit, and I sent everyone home with post-it notes of your URL. The cupcakes had a brownie-ish texture, which is absolutely fine with me. Topped them with some leftover dried cherries and iced a few with chocolate ganache from when we made your/Martha Stewart's ginger chocolate cupcakes. Hi, how many grams is the package of gelatin you used for the pastillage? How many pounds of pastillage would the recipe yield? Thanks. Nic, The pastillage weighed approximately 600 grams and the packet of gelatin 8 grams. oh, and where can I buy premade pastillage??? A water bath is when you take a pot, put a couple of inchs of water in it, heat it until boiling, then remove from heat or put on low simmer, place a heat proof bowl over the top of the pan (preferably metal and large enough so it doesn't fall in the pan). This allows you to gently melt the chocolate with heat from the seam as opposed to the too hot flame which can scorch the chocolate. I have't purchased premade pastillage, but I know my local baking supply store has it. You could try googling it, I am sure there are online stores that carry it as well as fondant.